Emdoneni Lodge is an owner run game farm in South Africa with lovely accommodation and facilities and a wild Cat Rehabilitation Programme. Emdoneni Lodge is located in the heart of Zululand on the Elephant Coast. Guests will appreciate the stunning scenery, natural sand forest vegetation and the abundant wildlife which roam freely about the grounds; common visitors include Impala, Zebra, Nyala, and Duiker, birdlife here is prolific too. At Emdoneni guests can interact with and learn about South African wild Cats while enjoying stylish accommodation and spectacular Big Five safaris at this KwaZulu-Natal Game lodge. Guests here can enjoy the personal touch and attentive service; the lodge-staff love their work and take pride in everything they do at Emdoneni Game Farm in South Africa. There are 33 Chalets, 6 Rondavels and 1 lavish Honeymoon Suite for comfortable and stylish accommodation. 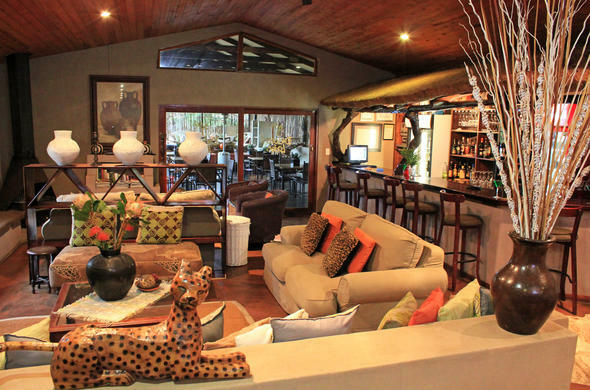 This KwaZulu Natal lodge has a swimming pool, spacious gardens and indigenous trees which can be found outside and inside the lodge - this is quite a feature in the bar. The restaurant serves traditional South African cuisine and fabulous 4 course fireside dinners in the Boma (outdoor enclosure) with Zulu dancers giving visitors an insight into African culture. The Cat Rehabilitation Programme is a delight - guests get to witness feline breeds, Cheetah, Serval, Caracal and the African Wildcat. Game drives are offered to see Big Five game at the Hluhluwe-iMfolozi Reserve. Emdoneni is also the perfect base for touring magnificent Zululand attractions.